A new way of fixing cases made from composite panels and aluminum makes it possible to abandon additional tools and cassette-drilling operations. At the same time the fixation remains as reliable and easy to realize as it used to be. The new means of fixation can be realized using new AYPC.150.0716 sliding frame. The fiber-cement plates fixation technique requires special solutions. In ALT150 system this solution is realized through the introduction of two new guiding rails. Wide T-guide AYPC.150.0103 to be used as primary at the plates joint, and narrow L-guide AYPC.150.0104 for intermediate fixation. Hidden fixing of ceramic granite has been realized in the system as an independent series of profiles and components, which does not interfere with the main system. This series can be used with an economical or enforced purpose guiding rails. The hidden fixing is performed with special anchors, agraffes, and a system of horizontal guiding rails AYPC.150.0105. The horizontal guide profile has a chamber (closed) section, thus it features a higher rigidity as compared to its equivalents. Due to high rigidity the guiding rail step can be 1.2 m. In the same way one can carry out the hidden fixing of natural stone. AYPC.150.0106 horizontal guiding rail system allows performing hidden fixing of natural stone in a different, more efficient way. Natural stone can be 20 mm thick. 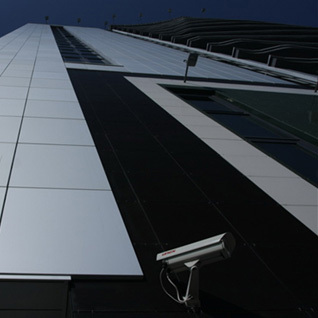 Rear-ventilated cladding system ALUTECH ALT150 is an up-to-date way to increase energy efficiency of a building and reducing its operational costs, increase attractiveness of the building for customers and tenants by creating better conditions for work and leisure. Design features of ventilated facades make it possible to extend maintenance-free service-life of all building components. 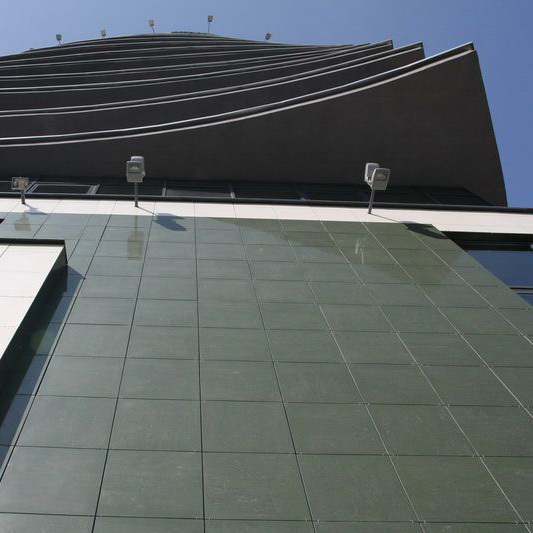 Due to a broad choice of facing materials applied in ventilated facades the building can be made unique and still easily match the architectural style of any city. There is no real alternative to ventilated facades. 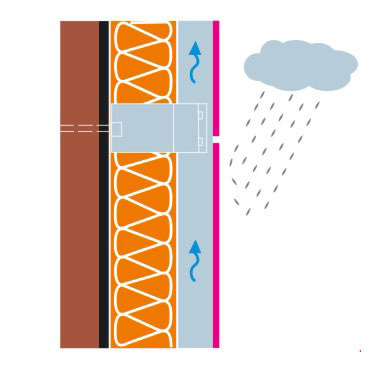 ALUTECH ALT150 system of ventilated facades consists of brackets and a guiding profile connected by an additional component that ensures unlimited compensation of thermal and mechanical deformations and a broad range of adjustments. ALUTECH ALT150 system is designed for constructing hanged ventilated facades with the use of different facing materials. Strength properties of the system allow its application on buildings up to 150 m high in V-type (fifth) wind regions, which is confirmed by expert opinion and calculations performed by Melnikov Central R&D Institute of Construction Material Structures (Moscow). 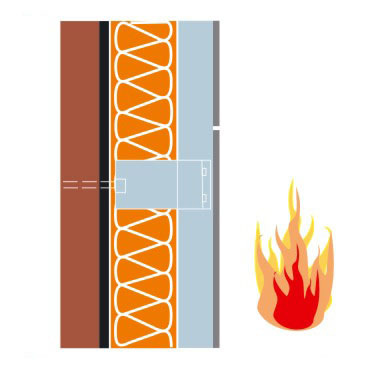 ALT150 system with regard to fire safety properties complies with requirements imposed on outer walls of buildings of various functional purposes, up to I fire-resistance rating and С0 fire hazard class. The system fire hazard class is K0. 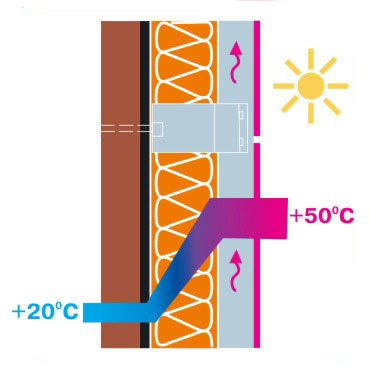 The life cycle of ventilated facades on the basis of ALT150 system is at least 30 years in a mildly aggressive and non-aggressive environment, and at least 25 years in a medium aggressive environment. The service life can be increased up to 50 years and above with the help of protective anodic coating. ALUTECH ALT150 system of hanged ventilated facades is the first system based on a T-shape guiding and L-shape bracket that features high rigidity properties, ensures unlimited compensation of thermal and mechanical deformations and has a range of adjustment possibilities. An unlimited compensation of thermal and mechanical deformations function has been realized in ALUTECH ALT150 system. The deformations are compensated due to a special connector of AYRC.150.0101 guiding profile and bracket.When using systems with a limited compensation or strictly fixed systems, the consequences may vary: in the best case it will be façade surface curving, in the worst - breakup of connections and collapse of the facade. The advantage of systems with unlimited compensation of deformations is evident: there is no need to control complex physical processes, the system performs it autonomously. One shall also take into account deformation of the building. The problem of buildings deformation becomes the more relevant the more the height increases. 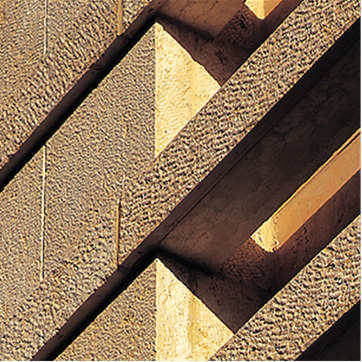 In such conditions only the system with unlimited deformation compensation can keep the façade’s appearance unchanged. 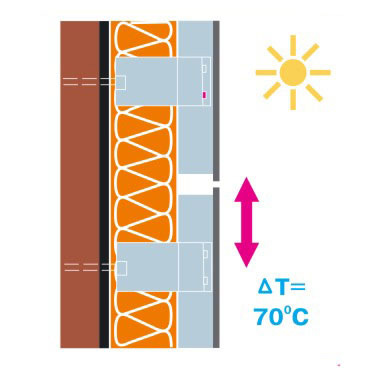 The Alutech Group experts have designed the special system to minimize the influence of “cold bridges” caused by brackets on the thermal insulation properties of the wall. The quality of insulation falls with the increasing number of brackets. AYPC.150.0101 guiding profile has sufficient rigidity to minimize their number. 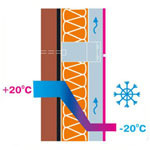 In addition a thermal insulation sealant is used between the wall and the bracket. It is made of plastic with low heat conduction coefficient. The sealant can be used only as support’s corrosion insulation, when the system is used without thermal insulation. paronite (AYPC.150.0903, AYPC.150.0904), used for corrosion insulation of the support from the wall in a system without thermal insulant (according to fire safety requirements). Application of ALUTECH ALT150 system allows concealing wall irregularities up to 250 mm, the adjustment range for one support is 50 mm. The substructure allows leveling vertical deviation of walls up to 10° without mechanical treatment of components. The broad range of adjustment and its simplicity increase the rate of installation. One of our system's know-how is the application of an additional support on weak sub-bases. The additional support increases the bearing capacity of the main supports by 70%. In other cases it will be necessary to increase the number of supports, and that could deteriorate thermotechnical uniformity and significantly raise the costs. The cleats in ALUTECH ALT150 system are made of austenitic stainless steel 1.2 mm thick. This type of steel has successfully passed all corrosion tests for ventilated cladding systems, which guarantees the system operation throughout the entire service life of the facade. To ensure the required strength, especially at the heights above 20 m, the cleats are manufactured of 1.2 mm thick steel. ALUTECH ALT150 cleats structure has been designed in such a way that the steel was not damaged during press forming and there were no stress raisers. Cleats in ALUTECH ALT150 system enable swiveling of tiles up to 30° with regard to the previous tile. When ceramic granite with standard dimensions 600х600 mm is used, the swivel radius will be at least 1 m.
All components are made of aluminum and stainless steel. Anodic treatment of aluminum components makes it possible to use the system in a corrosive environment. Anticorrosion properties of aluminum substructure significantly surpass properties of galvanized steel. At the same time the anticorrosion properties of aluminum do not suffer during the treatment and installation. Universal guiding profile enables various types of facing material fixation. This provides a wide choice of facing materials. All components of the substructure are supplied ready-to-use, which eliminates the necessity to do marking and drilling. The system structure prevents installation errors, thus increasing its reliability and durability. Rivet joints used in the system are one of the most sound and easy-to-use. During the replacement of the facing and separate components the structure’s integrity remains intact. The system components are reusable. ALUTECH ALT150 system is versatile and can be used for various types of faceworks. The versatility made it possible to reduce the number of components in the system and depart from keeping a stock of different systems. One of ALUTECH ALT150 system’s advantages is own production and consistent quality control at all stages: from the aluminum alloy to the packing of finished product. 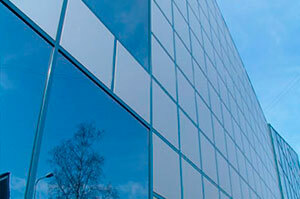 We obtain guaranteed required properties of materials and components. The customer may be sure the system he chose and installed corresponds to the one that passed all the tests and received positive evaluation. Consistent quality control ensures reliability of ALUTECH ALT150 system. The catalogue of technical solutions contains the entire list of units and fittings that can be realized by ALUTECH ALT150 system. 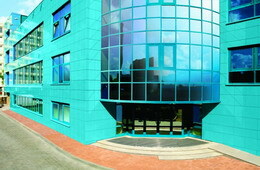 According to the expert report by the specialists of Melnikov Central R&D Institute of Construction Material Structures “the section in the catalogue of technical solutions dedicated to the calculation of a façade system can be acknowledged as an etalon procedure for ventilated cladding systems”. Subsystem based on AYPC.150.0101 complex section guiding profile belongs to a general purpose type. The required rigidity and strength of AYPC.150.0101 guiding profile has been perfectly calculated to prevent reduction of support step under heavy loads and prevent the increase of substructure’s cost, as well as investing in its rigidity more than it is necessary. The calculations allow its usage at the height up to 150 m (in a V-wind region). 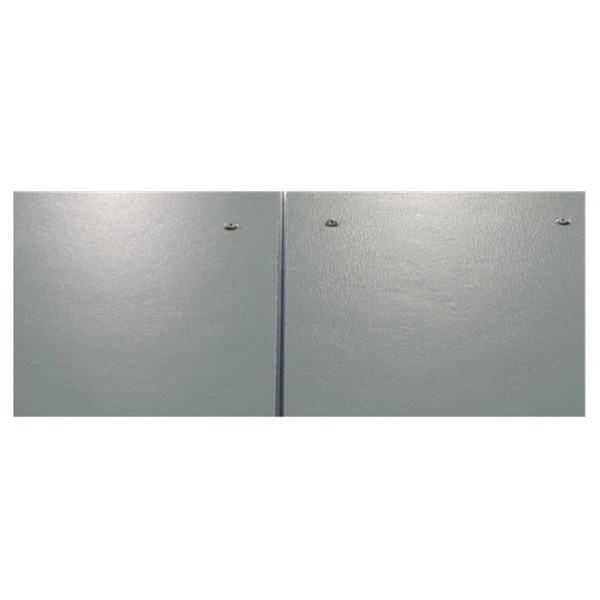 The subsystem enables using various finishing types and fixation means. ALUTECH ALT150 system with AYPC.150.0102 guiding profile is designed for paneling small buildings with ceramic granite and similar materials. A simple T-section guide is considered the lightest structure but does not possess the required rigidity. The use of this guide is possible for buildings of small height exposed to low loads. It stands out of other systems for a broader adjustment range. 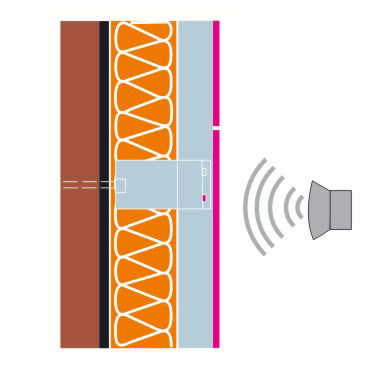 ALUTECH ALT150 system with AYPC.150.0103 and AYPC.150.0104 guiding profiles is designed for paneling buildings with fiber-cement plates or other flat materials. Fixing peculiarities of fiber-cement plates require the application of several guides – to fix plates at the joint and for the intermediate fixation.